Full size images of the awesome illustrations in The Garden, The Curtain and The Cross to use on big screens. Together with the the storybook these images allow you to read the story while showing the pictures on a large screen so that everyone can see them. There is a free word search and colouring sheet to download for children's groups too. This is quite superb. Beautifully written and illustrated, this tells the story of the gospel so captivatingly that little ones will want to read it again and again. I’m sure it will win many young lives to Christ. My grandchildren loved this book—and so did I. Both the pictures and the words have made the Bible's story of redemption clear and beautiful. This is a book that invites us in. I am so excited about this book! It is colorful, engaging, and creative, and that's just the icing on the cake! Our children receive invitations to participate in many different stories—stories of who they are, their purpose, and what God is like. 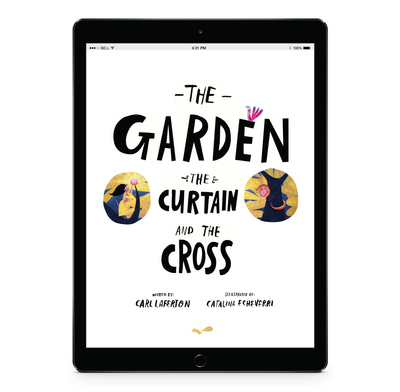 The Garden, the Curtain and the Cross is a brilliant re-telling of the one story that rules all other stories. I cannot commend this book highly enough. Read it to your children, give it to your neighbours, and talk about what it means to live in light of the fact that the curtain has been torn. A fantastic book that engages the reader (young or old). It clearly links key events in the Bible showing how and why they matter. We often read this book with our children and have given many copies to friends and family as well. We've loved this book for a long time now and the pictures, with all the colour and charm and detail to be explored, are brilliant. I bought the picture file when I needed to teach it in Sunday school, and having the pictures was so helpful for the teaching. Thank you! I recently gave this to my nephew (soon 6) and niece (soon 3), from a Christian home, and apparently they love it! I heard about Catalina Echeverri's work through friends and have since bought a number of her books as gifts. The books are faithful to God's word and look beautiful. They're a wonderful gift for both Christian and non-Christians, from whom I've had very positive responses. I bought this book as a gift for my grandsons at Easter and then discovered that they already had a copy and loved it. It is excellent, engaging and communicates the truth of Easter. A Bible overview in a children's Easter book? Genesis joy to Revelation wonder via the fall, the temple and the cross? In a children's book?! YES! And it is brilliant. The awesome truths of God's love, purity, salvation plan, victory, and grace are communicated with clarity and very engagingly. The rich illustrations support and extend the narrative. This was read upon opening and has been demanded twice more already today (Easter Sunday). Worth every penny to buy and give to our son and all our godchildren. Having just been through the 'Jesus Storybook Bible' with our Sunday School (mixed ages from 1 to 8) we wanted to keep the theme of the whole story of the bible pointing to Jesus and what he came to do for us. This story has been a great resource to do just that. We have used it alongside the activity books which each child has had as we have been going through the book bit by bit. Lovely colourful pictures and introduces the theme of Sin and our need to get back to God in ways children can grasp. Would throughly recommend. We have made the story last over about 4-5 weeks breaking it down into chunks. A really simple bible overview that helps children to see God's plan from Genesis to Revelation. This book focuses on the implications of human disobedience and how Jesus enables humans to live again in the presence of God. The book has great illustrations, simple repeated language, a clear message and a short application at the end. My children aged 3 and 5 love it. I was given this book free from the Publisher in exchange for an honest review. The book made a significant impression on my grandson (5) to the extent that my daughter was concerned that it was perhaps too graphic in its presentation of the cross. He just wanted it read over and over again. After several days he declared that he wanted to be Jesus' friend. The Garden, The Curtain and The Cross is excellent. A fresh, simple way to tell the Easter story. Love the repetition throughout the book. Great for families to read together or older children to read alone. Great to give away to non Christian friends and their children. Great to use for school assemblies. And brilliantly illustrated too. Would highly recommend it.